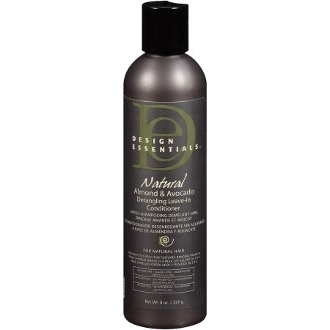 Our Products >> Design Essentials Detangling Leave-In Conditioner 8oz. Design Essentials Natural Almond & Avocado Detangling Leave-In Conditioner is a lightweight, non-sticky moisturizing conditioner with nourishing botanicals and vitamin E to penetrate quickly, instantly soften hair and smooth the cuticle for easy detangling. Natural oils improve manageability and provide luminous shine. Ingredients: Water, Glycerin, Methyl Gluceth-10, Polyquarternium-32 (and) Mineral Oil, Propanediol, Ethylhexylglycerin, Phenoxyethanol (and) Caprylyl Glycol, Fragrance (Parfum), Tocopheryl Acetate, Retinyl Palmitate, Sweet Almond (Prunus Amygdalus Dulcis) Oil, Tea Tree (Melaleuca Alternifolia) Leaf Oil, Avocado (Persea Gratissima) Oil, Jojoba (Simmondsia Chinensis) Seed Oil, Hydrolyzed Keratin, Propylene Glycol (and) White Nettle (Lamium Album) Flower Extract (and) Scots Pine (Pinus Sylvestris) Cone Extract (and) Burdock (Arctium Lappa) Root Extract (and Chamomile (Anthemis Nobilis) Flower Extract (and) Rosemary (Rosemarinus Officinalis) Extract Leaf (and) Ivy (Hedra Helix) Extract (and) Arnica Montana Flower Extract (and) Watercress (Nasturtium Officinale) Extract (and) Garlic (Allium Sativum) Bulb Extract. Instructions: Directions: Apply generously to damp hair and distribute evenly. Gently detangle by separating strands to remove knots and tangles. Follow with wide-tooth comb. Do not rinse. Style as usual. Design Essentials Detangling Leave-In Conditioner 8oz.